I've attached a pic of a vibe with the 1st part that i have zero idea its name. So need to replace those clips. 2nd. Any idea on the type of clip used? 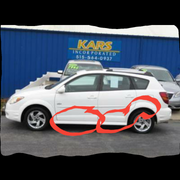 And when you look at ebay, as with the link above, Paterson Auto Wrecking in PA seems to have the most cladding parts. I'd contact them for the fasteners.